The Heliophos is a complex of 8 fully restored cave houses that enjoys a unique and quiet location in the Foinikia area, at 15 minutes walk from Oia. This studio has traditional décor, a wrought-iron bed with a mosquito net, a kitchen, satellite TV and a private balcony with sea views. Guests prepare breakfast in the studio. Breakfast products are included in the price. Studio with vaulted ceiling, sea views, seating area, air conditioning, kitchen and private balcony. The rate includes products for guests to prepare breakfast in the apartment. This spacious open-plan suite features vaulted ceilings, dark wood furnishings, a seating area, a period dining area, a kitchen, satellite TV and a private balcony. Guests prepare breakfast in the suite. Breakfast products are included in the price. Elegant suite decorated with items from Morocco, Turkey and France. It has a living room, bedroom, library, work area and fully equipped kitchen. Products are provided for guests to prepare their own breakfast. Please note that children can not be accommodated in rooms of this type. This elegantly decorated suite is located on the top floor and enjoys panoramic sea views from its 2 private balconies. It is divided into 2 levels and has a bedroom, living room and private bathroom. Upon arrival, breakfast products are provided, so guests can prepare their own breakfast. 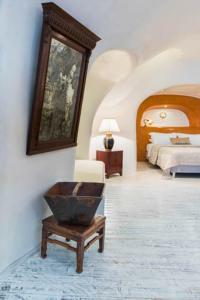 Open-plan suite with cave bedroom, period dining room, cement bathroom and access to a path that leads to Oia. The studio has 2 levels and is located on the top floor. 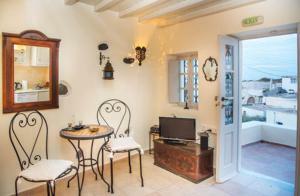 It has a large private terrace with views of the Aegean Sea. The 1er level includes 1 bedroom and private bathroom, while the 2º level has small lounge.